small understanding is cramped and busy. small words are chit and chat. How can we understand Taoism? It appears at first to be a school of philosophy, but then we learn that ordained Taoist priests, wearing formal robes, perform prescribed rituals before precisely laid-out altars. It seems firmly rooted in humanism, but then we discover that it boasts an extensive pantheon of deities who populate an elaborate network of heavens. It seems to address in the broadest terms the most general questions, but then we find that its theories are detailed in volumes of painstaking minutia. It may appear as a religion, but then it manifests itself as a system of alchemy, of medicine, of geomancy, of astrology, or in any number of bewildering forms. Somewhere the ancient Taoist sages are laughing at our confusion. "We look but don't see it," says Laozi, "and call it indistinct" (Daode jing, verse 14). Let us try to see. We will review the roots of Taoism in the ancient classics, consider key Taoist concepts, and then turn our gaze to religious Taoism. The story begins in the late Bronze Age, with Laozi. It is written in the Daode jing (The Way and Virtue), the small classic that lies at the heart of Taoism and whose authorship is attributed to Laozi sometime around the sixth century BCE, that "nonexistence makes it work." How appropriate, then, that Laozi's own existence has long been the subject of lively debate. Figure 1. 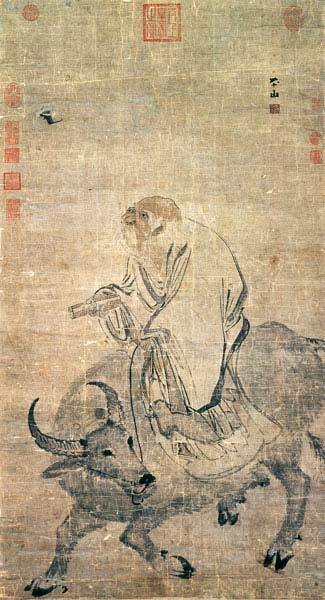 Laozi on an Ox, mid 1500s, by Zhang Lu (approx. 1490–1563), China, Ming dynasty (1368-1644), hanging scroll, ink on paper, National Palace Museum, Taipei. Laozi is said to have been traveling in the company of an ox and a servant boy when he dictated the Daode jing. According to Sima Qian (146–86 BCE) in his Shi ji (Records of the Historian), Laozi was a custodian of the imperial archives, an older contemporary of Confucius (some say the Lao in Laozi means "old," while others regard it simply as a family name), who retired to the west in his old age. At Hanku Pass between the Yellow River and the Chungnan Mountains, Sima Qian says, Laozi met Yin Xi, the Warden of the Pass, and revealed to him the text of the Daode jing. Figure 2. Loujuantai. The small knoll beyond the gravel bed of the Tien River at the foot of the Chungnan Mountains is where Taoists say Laozi wrote the Daode jing for Yin Xi, the Warden of the Pass. Photo by Bill Porter. But the Shi ji also alludes to a son of Laozi who served as a general of Wei in 273 BCE. The father of this man could not have been a contemporary of Confucius (551-479). Some scholars, particularly in mainland China, have dated Laozi in the fourth or third centuries BCE; others have held to the traditional dates (usually given as 604-531); and still others (especially in the West) have insisted that Laozi is a purely legendary figure who never existed at all. While "what has been transmitted through the ages about Laozi is of a purely legendary nature," according to Kristofer Schipper in the catalogue accompanying the Asian Art Museum exhibition, "the theory that Lao Tzu [Laozi] never existed or is merely a legend compounded of ... different accounts is no longer seriously entertained," says Wing-tsit Chan in his Source Book in Chinese Philosophy. Whoever Laozi may have been, "Chinese civilization and the Chinese character would have been utterly different if the book Lao Tzu [Laozi; the Daode jing is often referred to by this name] had never been written.... No one can hope to understand Chinese philosophy, religion, government, art, medicine—or even cooking—without a real appreciation of the profound philosophy taught by this little book" (Wing-tsit Chan). Figure 3. Laozi's Scripture of the Way, Upper Roll (detail), 700s, China, Dunhuang, Gansu province, Tang dynasy, (618–906), handscroll, ink on paper, Bibliotèque Nationale de France. What accounts for the extraordinary influence of this terse classic of 5000 words (about the length of this article)? By promoting ideals of nonconformity, individualism, tranquillity, acceptance, relativity, transcendence, and the primacy of the natural world, Taoism provided a counterpoint and a corrective to Confucianism, with its emphasis on social responsibility and hierarchies of authority. Its open-ended, suggestive style leaves much open to interpretation (the curmudgeonly British literary historian Herbert Giles once wrote that from it "little meaning can be extracted except by enthusiasts who curiously enough disagree absolutely among themselves"). In the Chinese tradition, the book is usually read with the help of some of the many commentaries that have been written on it over the centuries. The Daode jing is a deep, still pool from which the key tenants of Taoism are drawn. It is a kind of palipsest, a mirror to the reader, in which one can find the individual truths most corresponding to one's personal search. Long ago, a certain Chuang Tzu [Zhuangzi] dreamt he was a butterfly—a butterfly fluttering here and there on a whim, happy and carefree, knowing nothing of Chuang Tzu. Then all of a sudden he woke to find that he was, beyond all doubt, Chuang Tzu. Who knows if it was Chuang Tzu dreaming of a butterfly, or a butterfly dreaming of Chuang Tzu? Chuang Tzu and butterfly: clearly there's a difference. This is called the transformation of things. We are on firmer ground in speaking of the second great figure of early Taoism -- his uncertainties about his butterfly nature notwithstanding -- than we are with Laozi. It is generally agreed that Zhuangzi was a historical figure whose life probably spanned much of the fourth century BCE; he is said to have been a cleric in a lacquer workshop. According to Sima Qian, after working as a minor official, he somehow obtained the opportunity to become a prime minister but declined the offer. Only the first seven chapters of the book bearing his name, however, are believed likely to have been written by him; they are known as "the inner chapters." Figure 4. Zhuangzi Dreaming of a Butterfly, mid 1500s, by Lu Zhi (1496–1576), China, Ming dynasty (1368–1644), leaf from an album of ten leaves, ink on silk, Palace Museum, Beijing. This painting, by one of the finest Wu school artists of the sixteenth century, depicts a famous scene from the Zhuangzi. Today, for Taoists and non-Taoists alike, Laozi and Zhuangzi are considered considered a paired set ("Lao-Zhuang"), the twin progenitors of Taoism. But it was not until several hundred years after Zhuang's lifetime, in the fourth century CE, that the two began to be joined. In retrospect, the association seems inevitable, for despite their differences they share many attitudes, and both can be viewed in counterpoint to Confucianism. Zhuangzi was as much a literary stylist as a philosopher. While Laozi's Daode jing is philosophical in tone and telegraphic and evocative in style, Zhuangzi's work is composed of what translator David Hinton calls a "collage technique," making use of many tones and literary modes. In general it is lively, humorous, informal, and at times a bit sarcastic, especially when dealing with the shortcomings of competing Confucian attitudes. "In Chuang Tzu [Zhuangzi]," writes Wing-tsit Chan, "differences between Confucianism and Taoism become much sharper [than with Laozi]. The Confucianists teach full development of one's nature, fulfillment of one's destiny, and participation in the creative work of nature. Chuang Tzu, on the other hand, believes in nourishing nature, returning to destiny, and enjoying Nature. The Confucianists want people transformed through education, but Chuang Tzu leaves transformation to things themselves." Zhuangzi is above all a relativist (and relativism is anathema to Confucianism). Does he dream of the butterfly, or is it the butterfly that dreams of him? Once Zhuangzi was walking by a river with the Confucian philosopher Huizi, and he remarked on the happiness of the fish sporting in the river. Huizi challenged Zhuangzi: "You are not a fish. How can you know the happiness of fishes?" "I know it," Zhuangzi replied, "through the river." Stephen Little, the exhibition's organizer, explains: "According to Zhuangzi, true understanding should be acquired intuitively, without the need for explication. Huizi, a man obsessed with logical explanations, is unable to grasp this point." Figure 5. The Pleasures of Fishes, 1291, by Zhou Dongqing, Chia, Yuan dynasty (1260–1368), Zhiyuan reign, handscroll, ink and light colors on paper, The Metropolitan Museum of Art, New York, Purchase, Fletcher Fun (47.18.10). Zhuangzi's famous exchange with the Confucian philosopher Huizi on the pleasures of fishes was fodder for Zhou Dongqing, who specialized in paintings of fish. At the origin of things there was Thunder (Shu), ruler of the Southern Ocean, and Bolt (Hu), ruler of the Northern Ocean. And in the Middle Realm, PrimalDark (Hun Tun) ruled. Thunder and Bolt often met together in the lands of PrimalDark, and Primal Dark was always a most gracious host. Eventually, Thunder and Bolt tried to think of a way to repay PrimalDark's kindness. They said: "People all have seven holes so they can see and hear, eat and breathe. Only PrimalDark is without them. Why don't we try cutting some for her?" So ThunderBolt began cutting holes, one each day. On the seventh day, PrimalDark was dead. Figure 6. Diagram of the Supreme Ultimate, from the Compendium of Diagrams, 1623, by Zhang Huang, China, Ming dynasty, Tianqi reign (1621–1627), woodblock printed book, ink on paper, The University of Chicago Library, East Asian Collection. 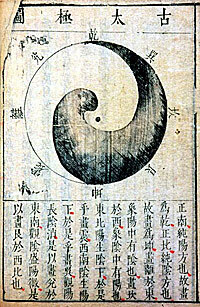 Taiji ("supreme ultimate") diagrams such as this one symbolize the interplay of yin and yang within the Tao; each contains the germ of the other. The Warring States period of the Western Zhou dynasty, when Zhuangzi lived, was a time of political turmoil but also a golden age of Chinese philosophy characterized by a "Hundred Schools of Thought." Each school had its own tao or "way." The word tao refers to a road or path (as in such English words as driveway, pathway, roadway, byway), and by extension, a way of doing something or regarding something (if it were not a familiar English word based on an earlier system of transliteration it would be spelled, and pronounced, dao). Whereas in other schools Tao means a system or moral truth, in this it is the One, which is natural, eternal, spontaneous, nameless, and indescribable. It is at once the beginning of all things and the way in which all things pursue their course. When this Tao is possessed by individual things, it becomes its characeter or virtue [de]. The ideal life for the individual, the ideal order for society, and the ideal type of government are all based on it and guided by it. As the way of ilfe, it denotes simplicity, spontaneity, tranquillity, weakness, and most important of all, non-action (wu-wei). By the latter is not meant literally "inactivity" but rather "taking no action that is contrary to nature"—in other words, letting Nature take its course. Figure 7. Seeking the Tao in the Autumn Mountains, 900–1000, by Juran, China, Northern Song dynasty (960–1126), hanging scroll, ink on silk, National Palace Museum, Taipei. "The title of Juran's Seeking the Tao in the Autumn Mountains fully expresses the meaning of this remote and dynamic landscape. Situated in a ravine, sitting under the eave of a thatched dwelling and entertaining a guest, a recluse contemplates the vital energy (qi) of the mountains that visibly swirls around his retreat. The landscape in this painting is a symbol of cosmic process, and simultaneously a symbol of the inner spirit-landscape of the human body. 'Seeking the Tao' here suggests that the adept is aware of the numinous life-force that creates and gives form to the terrestial landscape, and of the fact that what seems solid s actually in flux—a flux generated by the flow of qi through the earth. these ideas lay at the heart of the Chinese discipline known as fengshui (geomancy)" (Stephen Little). For Taoists, the Tao is the undifferentiated primal void that underlies and pervades all being. It is the unspeakable and unknowable that lies beyond human understanding. "In the Taoist vision of cosmogenesis, there was first the Tao, empty and still," writes Stephen Little. "Then, gradually, primal energy (yuan qi) was spontaneously generated out of the Tao." The primal energy, qi (pronounced "chee") is always in a state of flux -- in fact the only constant in the universe is the persistence of change. The material world is but a manifestation of the operations of qi, as the Taoists anticipated quantum physics in exploring the nexus of energy and matter. Qi was considered to manifest itself particularly strongly in certain areas, such as mountains and caves. Feng shui is essentially the art of directing qi, or at least of responding to its directions. In terms of the inner alchemy of the human body, qi was seen as governed by the vital force of breath. (This is analogous to the Western concept of inspiration, which also derives from the concept of breathing.) Traditional Chinese medicine views illness as caused by blockages in the flow of qi. Acupuncture is one technique for removing such blockages and releasing the backed-up qi, thereby restoring the balance of yin and yang. Figure 8. Illustration of Inner Circulation, 1800–1900, China, Qing dynasty (1644-1911), ink rubbing, ink on paper, Richard Rosenblum Family Collection, Newton Center, Massachusetts. This rubbing expresses the Taoist notion of the transformation of things, for the same forces that manifest themselves as mountains, rivers, celestial bodies, animals, and plants are also viewed as operating within the microcosm of the human body. "The rubbing consists of a diagram of the head and torso, seen from the side. The entire diagram is framed on the right by the spinal cord, which connects the lower torso with the cranial cavity. Within the three major sections of the body—the head, the upper torso, and the lower torso, the areas of the three 'cinnabar fields' (dantian)—complementary images of yin and yang energy are shown intermingling" (Shawn Eichman, in the exhibition catalogue). According to Taoist belief, the vital force, qi, initially manifested itself in a kind of undifferentiated noumenon called hundun (what David Hinton rendered as "PrimalDark" in his translation of Zhuangzi's parable, above). Out of this vague, swirling, massless mass, yin and yang emerged, like substances separated in a centrifuge. The interplay of these two opposing qualities gave birth to the material world in all its many forms. Yin is dark, female, and subtle; yang is bright, male, and overt. Winter is yin, summer is yang; the moon is yin, the sun is yang. In a commentary on the Daode jing presented to the emperor in 1078, Lu Hui-ch'ing wrote of the verses quoted above: "Dark and unfathomable is yin. Bright and perceptible is yang. As soon as we are born, we all turn our backs on the dark and unfathomable yin and turn toward the bright and perceptible yang. Fortunately, we keep ourselves in harmony with the breath between." To some extent, Taoism can be viewed as championing of the virtues of yin in the face of Confucianism's emphasis on yang. Today the symbol of yin/yang is the taiji diagram (fig. 6), but it did not appear in a Taoist context until the Song dynasty (960–1279). Before that time, yin was represented by the tiger and yang by the dragon; this convention dates at least from the Zhou dynasty (approx. 1050–256 BCE) and probably from the Neolithic. The tiger and dragon are often found as a paired motif in Taoist iconography. "In addition to symbolizing yin and yang, the tiger and dragon also symbolize west and east, and the elements (or phases) fire and metal. In Taoist chemical alchemy (waidan, or "outer" alchemy), the tiger and dragon also represent two of the most powerful elixir ingredients known, lead and mercury, while in the Inner Alchemy (neidan) tradition, the two animals symbolize yin and yang as they are brought together in the inner (human) body through visualization and transformed to create a divine embryonic form of the practitioner" (Stephen Little). Figure 9. Two Panels from a Sarcophagus: Tiger and Dragon, approx. 500–534, China, Northern Wei dynasty (386–534), limestone with traces of pigment and gilding, private collection. The tiger and dragon are ancient symbols of the forces of yin and yang respectively. From its ancient beginnings as a philosophy, a guide to conduct, and a commentary on governance and ritual, Taoism developed over the centuries into an organized religion, changing significantly in the process. 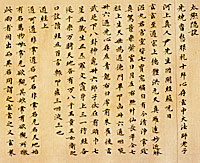 Under Emperor Wu (reigned 140–87 BCE) of the Han dynasty (206 BCE–220 CE), Confucianism began its long tenure as China's official state ideology. But Taoist ideals remained strong, particularly among commoners. In 142 ce, a Taoist hermit named Zhang Ling (or Zhang Daoling) was visited by a vision of Laozi. Laozi, now calling himself the "Celestial Master," revealed to the devout hermit a "new testament," prohibiting sacrifice and rejecting the old gods and spirits who accepted sacrifices. In their place, Laozi presented Three Heavens. "The Three Heavens each contained one cosmic energy (qi), called, respectively, 'Mystery,' 'Principle,' and 'Origin' (xuan, yuan, and shi). They had three colors—blue, yellow, and white—and constituted the roots of Heaven, Earth, and Water. Each had its own virtue: Heaven (in the sense of the sky) gave forth blessings; Earth forgave sins; and Water averted calamities. Three officials (Sanguan), pure emanations of the Tao, performed these functions," explains Kristofer Schipper in the exhibition catalogue, adding that "Here we find for the first time a true Taoist pantheon ... distinct from the ephemeral gods, spirits, and ancestors of ancient China." Zhang Daoling is credited with establishing the first organized Taoist communities, although it was not until the Six Dynasties period (420-589) that Taoism became fully formed as a religion. As the religion developed, Laozi became deified and a new pantheon of gods, goddesses, and immortals emerged, among them Taiyi (Supreme Unity), Queen Mother of the West (Xiwangmu), Celestial Worthy of Primordial Beginning, Marshal Wen, the Dipper Mother (fig. 12), Zhongli Quan (fig. 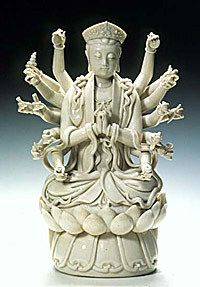 11), and countless more; even Buddhist figures such as Guan Yin were welcomed into the Taost pantheon. Still, "the high gods of Taoism ... are ultimately mere pneuma who exist to put a recognizable face on the Tao itself" (Stephen Little). Figure 10. The Realm of All Mountain Kings and the Six Spirits of the Household, approx. 1600, China, Ming dynasty (1368-1644), hanging scroll, ink, colors, and gold on silk, Musée National des Arts Asiatiques Guimet, Paris, EO742. In its later elaborations, Taoism produced a staggering multitude of deities. Among those shown here are the Stove God, the Door God, the Kitchen Door God, the Well God, and the Earth God (the sixth household god alluded to in the title, the Lattrine Goddess, is missing), along with several mountain deities. Figure 11. The Immortal Zhongli Quan, late 1400s, attributed to Zhao Qi, China, Ming dynasty (1368-1644), hanging scroll, ink and colors on silk, The Cleveland Museum of Art, Purchase from the J.H. Wade Fund, 76.13. Zhongli Quan is considered the leader of the Eight Immortals. The immortals, or adepts, were individuals who had achieved unity with the Tao through the cultivation of virtue and understanding. The popular figures, analogous to saints, reflect Taoism's spiritual striving. Zhongli Quan was a patron of Inner Alchemy (healing), and the double gourd he holds no doubt has an alchemical application. Figure 12. The Dipper Mother, 1700–1800, China, Qing dynasty (1644–1911), dehua porcelain, Asian Art Museum, The Avery Brundage Collection, B60P1362. The Dipper Mother is the mother of the stars of Ursa Major, the Big Dipper. Thought to derive from one of the devas (inhabitants of the heavenly realms) of Buddhism, she is associated with healing and childbirth. In this remarkable porcelain from the museum's collection, she is sitting on a lotus throne and wearing a crown. She has a third eye in her forehead, and her eighteen arms hold a variety of sacred weapons and vessels. Taoist ritual is a public event, designed to serve the needs of a community. The central figure in any Taoist ritual is the priest (daoshi), who petitions the gods ion behalf of the community he serves. Incorporating words, music, and dance, Taoist ritual is a performance closely linked to theater and may last from several hours to several days. In the course of a ritual, the priest visualizes his own return to the Tao, the source of all things. Among the sacred dance forms in Taoist ritual is the symbolic pacing of the stars of the Northern Dipper (the Big Dipper), the seat of the celestial bureaucracy of the gods. The Taoist ritual space, or altar (daochang or daotan), reflects the structure of the cosmos, and is visualized as a sacred mountain connecting the human and divine realms. The altar may be installed anywhere, and is taken apart when the ritual is complete. Figure 13. Taoist Priest's Robe, mid-1800s, China, Qing dynasty (1644–1911), embroidered silk tapestry, The Minneapolis Institute of Arts, the John R. Van Derlip Fund, 42.8.118. Taoist priest robes are often visually spectacular, rich in Taoist iconography. Several appear in the exhibition. Among the symbols on this colorful robe are the taiji diagram, the yin/yang tiger and dragon, the Five Sacred Peaks, andf many more. Figure 14. Taoist Ritual at the Imperial Court, approx. 1723–1726, by Jing Bingzhen, China, Qing dynasty (1644–1911), hanging scroll, ink and colors on silk. Arthur M. Sackler Gallery, Smithsonian Institution, Washington, DC; Purchase Smithsonian Collections Acquisitions Program, and Partial Gift of Richard G. Pritzslaff, S1991.99. 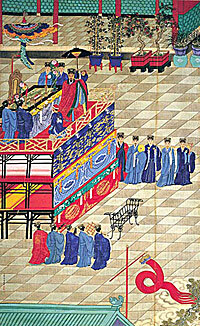 This painting depicts a Taoist ritual being performed on an altar made of three stacked tables. The verticality of the altar is probably a metaphor for the mountain, considered a sacred space where qi is strongly manifested. The long story of the evolution of religious Taoism across the millennia is beyond the scope of this article, but a sense of its many changes can be obtained through the more than 150 objects on exhibit, including paintings, sculpture, calligraphy, textiles, ritual objects, and rare books borrowed from nearly seventy lenders in more than ten countries (significantly, thirty-three works will be borrowed from institutions in the People’s Republic of China, only two of which have been previously exhibited in the West). For artists, Taoism offered a rich repertoire of subjects, as the sampling of illustrations presented here suggests. But it also offered a way of seeing, and a way of doing: a tao of art. The first of the "six laws of painting" set down by the scholar Xie He in the early sixth century CE reads qiyun shendong: "convey movement through harmony of spirit." [curators: translation okay?] Taoist artists, understanding that existence is fluid, typically created lively works full of movement, as they sought to transmit the essence of their vision by serving as a vehicle for the expression of qi. The result is a marvel: we need only to look -- and to see. This article was written for Treasures, the member's magazine of the Asian Art Museum, where the exhibition Taoism and the Arts of China, organized by the Art Institute of Chicago, was presented from February 21 through May 13, 2001. The article is offered here in support of the museum's nonprofit educational mission.